Women in the Arts: "Celebrating the Genius of Women"
The Call to Artists deadline was January 22, 11:00 AM (ET). The Call to Artists is now closed. It has been a privilege to witness through the numerous entries, artwork, and biographies, the WEALTH within our women artists' world community; finding a common thread, universal, of topics reflected in the language of the artists, through a variety of media, while expressing its own identity. Women in the Arts is most thankful for receiving your entries. These were received with enthusiasm and considered with respect and appreciation. We are cheering for you, and the stage you are in your art profession. If your art entry was not selected this year, do not let this discourage you in any way, please enter again next year. We'd love to receive your new work. As we announce the finalists and honorees for this year, I hope you join us now through April to celebrate the accomplishments of fellow women artists, via social media and at the awards event on March 23 at the Orlando Public Library. 8th. Annual art competition and recognition event. 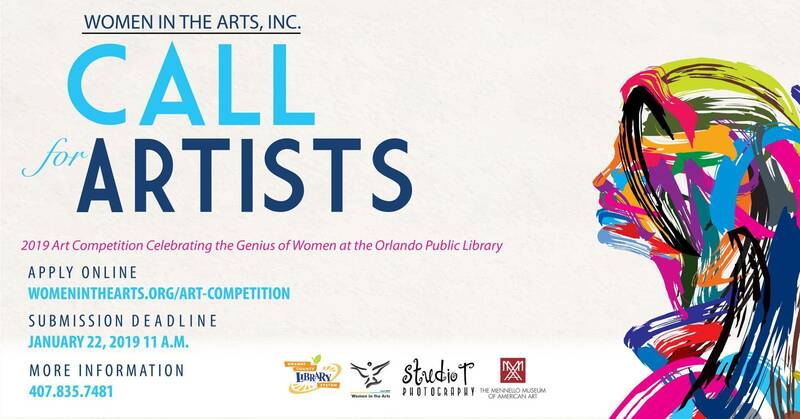 Women in the Arts, Inc. invite professional female artists to submit their work for the 2019 Women in the Arts competition "Celebrating the Genius of Women" at the Orlando Public Library. Finalists will be chosen from the entries submitted. Selected art will be featured in the upcoming 8th. Annual Celebrating the Genius of Women exhibition at the Orlando Public Library in March and April 2019. Local finalists will be eligible for up to $2,000.00 in cash prizes and in-kind awards. The Awards event is March 23. Women in the Arts, Inc. invite professional female artists to submit their work for the 2019 Women in the Arts competition "Celebrating the Genius of Women" at the Orlando Public Library. Selected work will be part of the on-site digital exhibition at the 8th. Annual Celebrating the Genius of Women at the Orlando Public Library in March and April 2019. Honorees will be recognized at the awards event on March 23. In-kind awards apply. Scroll down for the awards' description. Women in the Arts will choose finalists from all entries in a series of two rounds. Finalists are invited to display selected art at the Orlando Public Library to be considered for a final vote by Women in the Arts Jury Team composed of past winners, fellow artists, and guest jury. Library patrons will also have the opportunity to vote for their favorite artist. The jury decision is final with no reviews or feedback. Selected artwork will be displayed on a digital screen part of the exhibition at the Orlando Public Library gallery, during the months of March and April 2019 at "Celebrating the Genius of Women" on-site exhibition and competition. U.S. and International Honorees will be recognized at the awards event on March 23. For travel information, please contact womeninthearts@gmail.com. The Awards Jury is formed by Women in the Arts board and advisory board members, curators, past competition winners' representatives, and a guest jury. This jury awards the art competition finalists. Total cash awards up to $2,000.00. Annual membership to the Mennello Museum of American Art, Orlando, FL. Publicity on printed and/or online media outlets. March-April 2019. "Celebrating the Genius of Women" at the Orlando Public Library. March - April, 2019. All events are free and open to the public. Oct. 1 at 11:00 AM. Entry form opens. Jan. 22 at 11:00 AM. Entry form closes. Feb. 12 at 11:00 AM. Finalists announced. Mar. 01-08. Finalist art install. Mar. 09-18. Public Vote period, Social Media Vote, and Jury Team Final Voting. Mar. 09-Apr. 23. Finalists' Art Exhibition and International and U.S. artists digital exhibition. Mar. 23. 2:00-4:00 PM. WOMEN IN THE ARTS AWARDS. Meet the Artist and awards reception. Winners announced. RSVP and event details TBA. This event is sponsored by Women in the Arts, corporate and private donors, Studio-T Photography, The Mennello Museum of American Art; in partnership with the Orlando Public Library.